Bahrain video surveillance market is registering positive growth on a year-over-year basis buoyed by growing consumer awareness, transition from Analog to IP video surveillance systems, need to enhance the level of security, as well as overall growth in infrastructure/real estate projects in the country. Although, the country acquired minimal revenue share in the overall GCC video surveillance market, however, Bahrain is likely to possess greater opportunity over the coming years owing to major upcoming projects in Northern and Capital regions. In the overall Bahrain video surveillance market share, northern region acquired major revenue share. this was primarily due to numerous commercial and government projects in the region. Bahrain video surveillance market forecast period revenues would be led by growth of IP surveillance segment only. Additionally, in terms of market players, Axis Communications, Bosch, Avigilon, and Hikvision captured key share in the Bahrain video surveillance market. The Bahrain video surveillance market report thoroughly covers the market by video surveillance types, components, verticals, and regions. 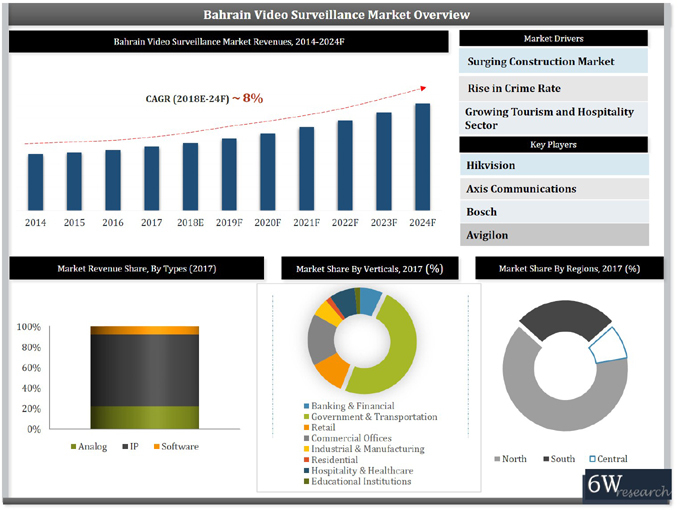 The Bahrain video surveillance market outlook report provides an unbiased and detailed analysis of the on-going Bahrain Video Surveillance market trends, opportunities/ high growth areas, market drivers which would help the stakeholders to device and align market strategies according to the current and future market dynamics. 13.4 Hangzhou Hikvision Digital Technology Co. Ltd.